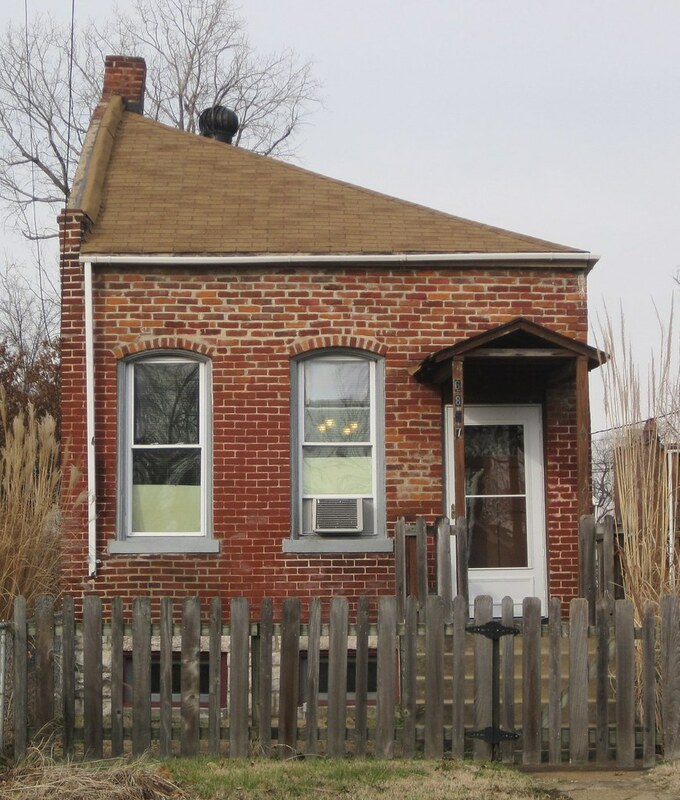 Building research in the City of St. Louis, while not exactly straightforward, is a rewarding process that can yield important information about the history of your house and your neighborhood. 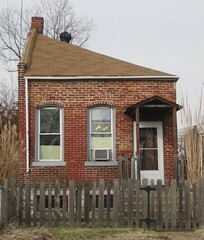 A flounder house in the 6800 block of Southwest Avenue, St. Louis. Before you get started, find out if your house is in a historic district. The City of St. Louis has online maps showing local and National Register districts in the City. If it’s in a National Register district, there is a good chance that someone has already put together basic information like date of construction and architect. National Register nominations and detailed maps are available online from the State Historic Preservation Office. If you don’t think anyone has done the research yet, you’re in for a more complicated process. Fortunately, you are likely to be able to find permits, deeds, census records, directory listings, and historic maps for your City property. Building permit records are spotty in the 1870s and early 1880s; if you are lucky enough to own a building constructed before 1870, you won’t find a permit and will have to rely more on other sources of information. It’s good to start your research with an approximate idea of when your building was constructed. If you don’t know, you can check the City Assessor’s database. Search for parcel data by address, then click on the “Building Information” tab to find out when they think the building was constructed. The more recent the house is, the more likely it is that this date is correct. In most cases, it won’t be off by more than a few years. Also note your city block number, which you will need for permit and deed research. Once you have that number in mind, there are a few ways to get started on your primary research. Building permits were issued based on address starting in 1900 — so if your house was built in the 20th century, you can start with the building permit. In the 19th century, permits were issued before the addresses were assigned. Instead of an address, the permit records only show the street and block where the house was to be constructed. With an address in mind (for 20th century buildings) or an owner’s name (for 19th century buildings — see next section), you are ready to find your building permit. The Comptroller’s Office keeps microfilmed records in Records Retention, Room 1, in the basement of City Hall. After you are buzzed in, ask to look at the “active” and “inactive” permits for your city block number. (If you didn’t write it down before, there is a map on the wall that will help you.) Inactive permit records are for all dates before the late 1920s. In most cases, these reels will cover some or all of the 1930s. Active permit reels pick up where the inactive records leave off and summarize permit information into the 1970s. Once you are set up on the microfilm machine, find your City Block number on the reel. You should be able to track down permits for construction and alteration by address starting in 1900 and by owner and location prior to that. 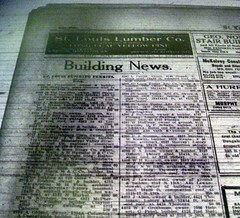 A typical "Building News" column in the St. Louis Daily Record. At this point, you’ve seen some but not all of the building permit information. The records at City Hall are incomplete transcriptions of the original permits, which no longer exist. After 1892, the St. Louis Daily Record summarized all permits issued. The information contained in the Daily Record supplements the permit information at City Hall. While the Central Library is under construction, the Daily Record is boxed up at the Carpenter Branch. Ask for it at the desk. Once you’re set up, find the “Building News” section for the day after your permit was issued. Summaries are listed by number (this was probably on the microfilm at City Hall) and usually include owner, builder, architect, dimensions, features such as type of heat system and roof, and estimated cost. The City’s deed tracking system is wonderfully arcane — difficult to explain, but surprisingly efficient compared to options in other counties. Again, you’ll start by knowing the block number of the property you’re researching. Start in the Assessor’s Real Estate Office on the first floor of City Hall. Under the customer service counter you’ll find a series of long plat books that show parcel divisions and current owners. Find your parcel, and it will include a hyphenated number that points you to an abstract for the most recent deed. (Usually this will be a four-digit book number followed by a page number of one to three digits.) The most recent abstract books are filed under the large table in the center of the room. Earlier books are found on microfiche next to the two readers on the counter. Each abstract will include the names of the buyer and seller, consideration (the amount paid, usually recorded as $100 or $1), the type of instrument (the most common will be a Warranty Deed – WD, or Quit Claim – QC), date of the contract and date recorded, book and page reference for the full deed, and (hand-written below the legal description) the book and page for the previous transaction’s abstract. By following this reference back the same way, you find each sale or transfer of the property. If you lose the thread, all hope is not lost. There are several techniques for re-establishing your broken chain of title. Start in Room 129-A of City Hall. First, try looking up the earliest deed you’ve found, which may include a reference to the previous deed. Archivists can also help you use indexes to find the name of your earliest seller, and find transactions in which that person is a buyer. The St. Louis Public Library and the Missouri Historical Society have terrific resources to learn more about the people who lived in the building. City directories, Red Books (for commercial buildings), Blue Books (a directory of the upper class), and Red-Blue Books are all useful sources to look up names and addresses. At the Missouri Historical Society’s Research Center on Skinker, City Directories are on open shelving in the main reading room. The Archives have also created an impressive database of building references by address. The United States Census has become significantly easier to use in the last few years due to the efforts of genealogists. The St. Louis Public Library and St. Louis County Library have subscriptions to Ancestry.com, a web service which has indexed federal censuses through 1930. If you have a library card for either the St. Louis or St. Louis County Public Library, you can use their online subscriptions to HeritageQuest. Type in the name, state, and census date you’re looking for, and the service shows actual census pages. The information collected always includes the name and age of each household member; you can also learn (depending on the year), their race, the place of birth of their parents, year naturalized, and whether or not they own a radio. If you’d like to find your street in the census but you don’t have a person’s name to look up, you can look up the intersection here. At Preservation Research Office, we’re always happy to share our research and tips. If you have any questions, or are interested in taking your research to the next level, please contact us!